The 2015 Eagle-Mustang 5K Color Run is right around the corner! 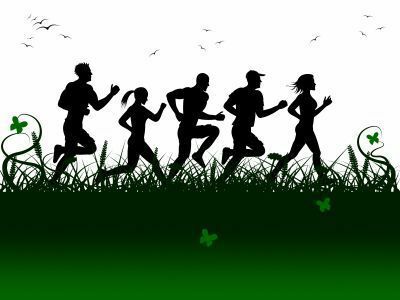 This fun run to support Pearce Excellence in Education Fund (PEEF) and Richardson’s Eagle Fund takes place on March 21, with the race kicking off at 9:00 AM. If you haven’t been particularly active lately, don’t plan on going all out for the run, though. A major component of preventing tendinitis (and other injuries) is to make gradual changes with your physical activity. Given that Achilles tendinitis often results from a sudden increase in duration and intensity of activity, begin any new workout program slowly. Gradually build up from there, but don’t push yourself too hard. A good rule of thumb is to only progress your duration by 10% per week. Keep in mind that you are not going to run a marathon or shed twenty-five pounds in one week, so pace yourself. Warm up and stretch properly before an activity that will place stress on your Achilles tendons. This is solid advice for anyone who is staying active, but especially for all you “weekend warriors” out there who perhaps only participate in a rec sports league on the weekends. If the rest of your week is fairly sedentary, your body is not accustomed to the physical demands and you need to prepare it first. Cross-training is not only an excellent way to ward off injuries like Achilles tendinitis, it also goes a long way to improving your overall conditioning. Running definitely has its merits and is an excellent component of an active lifestyle, but adding low-impact exercises like swimming and cycling can enhance your conditioning. Our caring staff here at Richardson Podiatry Associates hopes that you do not have to suffer through an injury in the first place. If your plan for preventing tendinitis didn’t pan out, or if you have already sustained this injury before reading this, we will help you get on the road to recovery at our Richardson, TX office. Simply give us a call at (972) 690-5374 or take advantage of our online form to request an appointment today.